Located near the northern boundary of Section 14 in the township of Washington at the intersection of Narrow’s Creek Rd. and Tuckertown Rd., near Hillpoint, there once existed the tiny hamlet of Tuckerville, known in the 20th century as Tuckertown. Aden Tucker settled with his family in the area around 1853 and lent his name to the small community. His daughter, Jane, was conducting a private school in their cabin that same year. A postoffice was established there in 1880 under the name of Tuckerville, with John T. Pollock as Postmaster. The mail arrived on Wednesdays and Saturdays. A small rural cemetery was plotted at that location in 1858, and was deeded as the Washington Union Cemetery in 1862 with Aden and Judith Tucker as grantors. Around 1868, the United Brethren organized and began holding services in settler’s homes. A "very neat and roomy church" was built in 1876 at a cost of $1,100, on land sold to the members by Aden & Mary Tucker, for $100. Rev. James Aldrich dedicated the building that June. A parsonage was constructed in 1873 (still standing). Eventually most or all of the parishioners joined the Lime Ridge church. The building was sold to St. John’s Lutheran church in 1889. 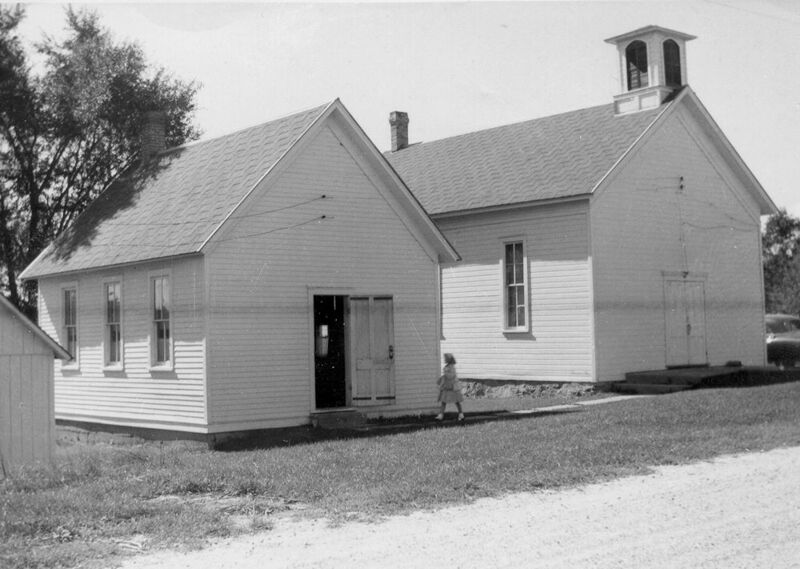 A parochial school was built in 1918. These structures served the congregation until a new house of worship was built in the village of Hillpoint in 1958. The old Tuckertown church was torn down around 1979, and the town board is currently responsible for the upkeep of the cemetery. Washington township farmers brought their milk to a cheese factory in Tuckerville, which was operating in 1880, run by Edwin Booker, with a capacity for producing 400 pounds a day. Section 14 also had a water-powered grist and flour mill on nearby Narrows Creek, put up in 1879 by John Williams, the first in the township. It was capable of producing 100 bushels per day. Early settlers in Washington township dealt with many hardships, the first being the clearing of land and the construction of a suitable dwelling to house themselves and their families. Often times a man would be away from home 5 out of 7 days helping his neighbors clear land and construct their own log cabins. Many of these early pioneers were English by birth. Today, the tiny hamlet of Tuckertown is primarily known for the cemetery where many of the area’s early settlers lie at rest. A small frame parochial school building still stands, along with the original parsonage–the only structures left in the hamlet. The Amish have renovated the school and it is in use today as a center of learning for their youth.